Kyle Freeland pitching. Credit: Allan Henry, USA TODAY Sports. 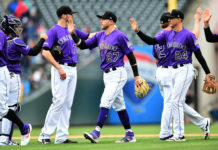 A sweep was just what the doctor ordered, keeping the Colorado Rockies in contention for the first NL West title in the team’s history. Colorado swept Arizona with a 2-0 victory on Sunday to improve to 85-70, still 1.5 games back of the Los Angeles Dodgers in the West. And now 2.0 games back of the St. Louis Cardinals for the NL Wild Card. 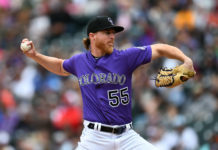 The Rockies jumped out to the lead in the third inning when DJ LeMahieu hit a single off Zack Godley. And then Nolan Arenado followed it up with a massive double which one-hopped into the wall at 413 feet, scoring LeMahieu. Then, Ian Desmond crushed a ball, but is sliced foul and ended up being caught to end the inning. In the fifth, it was LeMahieu getting it going again, this time walking. Then Arenado walked. And Gerardo Parra came through huge with a single to score LeMahieu and push the lead to 2-0. For Godley, he hit the 90-pitch mark in only the fifth inning. That was the end of the day for Godley, who gave up six hits and three walks with two strikeouts. Meanwhile, Kyle Freeland was dealing all Sunday long. 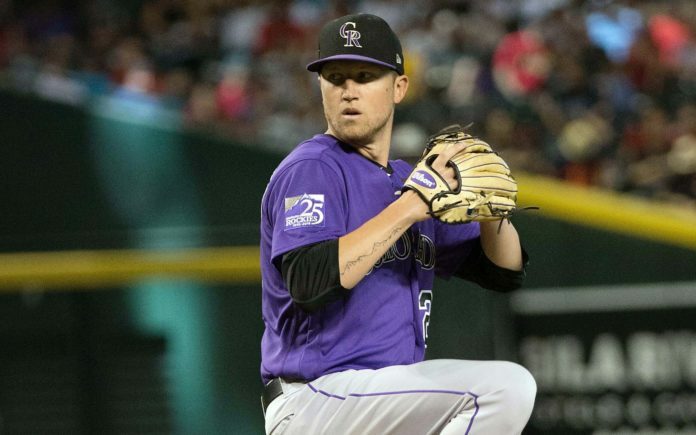 The Denver native cruised into the sixth inning with a pitch count into only the 60s. 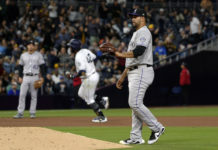 Freeland worked through the seventh inning, and through a jam, finishing by giving up seven hits and one walk with six strikeouts and no earned runs. Adam Ottavino came in and walked two batters, being pulled for Sueng-Hwan Oh who escaped the eighth inning. Then, Wade Davis came in to work the key, ninth inning and finish the Diamondbacks off. For the Rockies, the sweep of the Diamondbacks was crucial. Colorado was swept by the Dodgers before this series and now return to Coors Field to face the Philadelphia Phillies in a three-game set.